My original plans for this week's tot activities included mermaids, the ocean, and the beach. However all four kiddos have been sick, and we haven't done much of anything. As I pulled out all of my ocean and beached themed materials, the many sea turtles we have acquired over the years stuck out at me. What a wonderful way to talk about the ocean and the beach all in one unit! I'm very pleased with how it turned out. Sunshine LOVES animals and enjoys learning about them. Choosing an animal a week has a been a great way to work on colors one at a time, in hopes that they may eventually sink in. This won't be the case every week, but for this month it's worked out great! 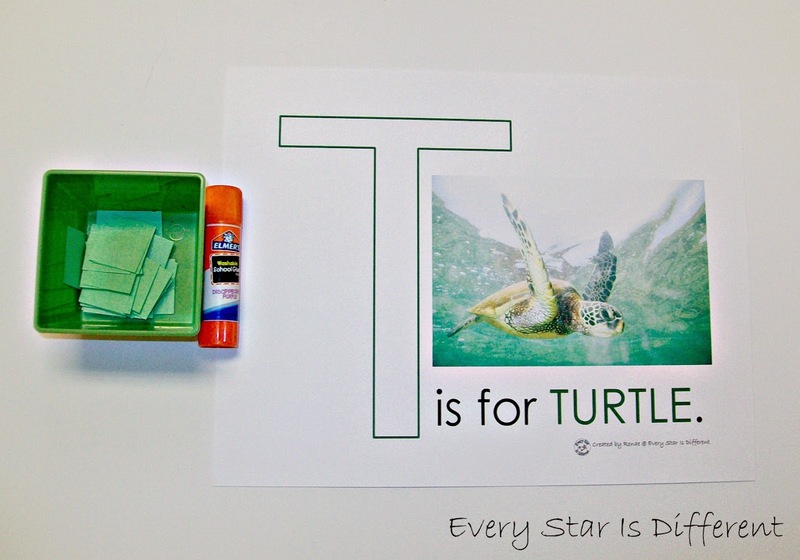 In this activity, Sunshine will glue the green squares on to the "T" for turtle. She's not a fan of gluing, but I'm hoping with practice she'll enjoy it more. If she refuses to use the glue stick, I plan to introduce a liquid glue with a paint brush, as I know she loves to paint. Once she "paints" she can press the green squares on top of it. 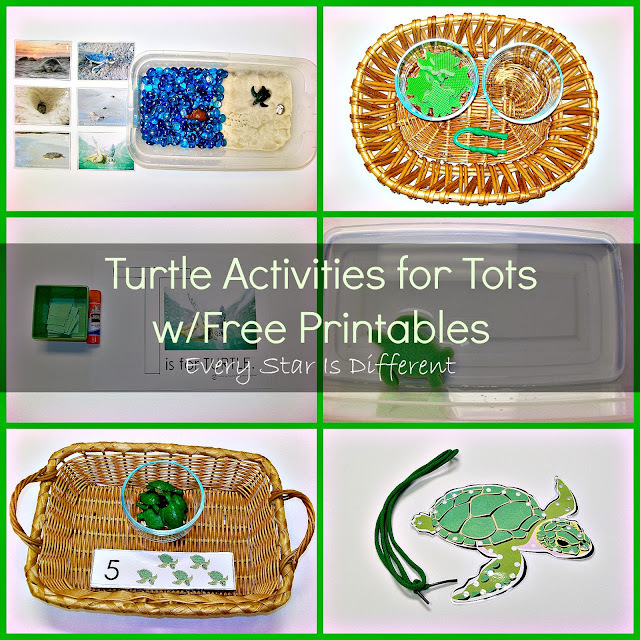 Source: I created the printable for this activity as part of my Sea Turtle Activities for Tots Printable Pack 1. For your free copy, click on the link at the bottom of this post. Sunshine did such a fabulous job counting her sharks last week. I think I finally found a way that works with her after several failed attempts. 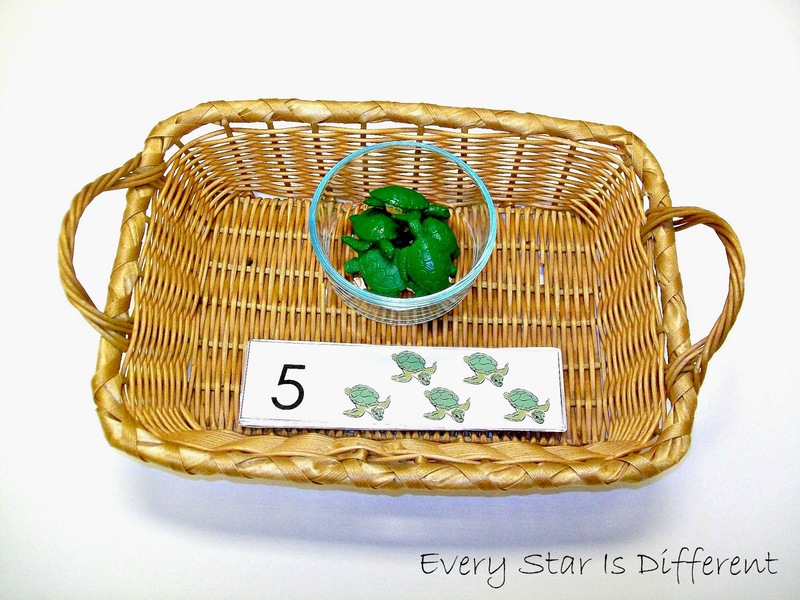 In this activity she will count out sea turtles to match the amount on each card. 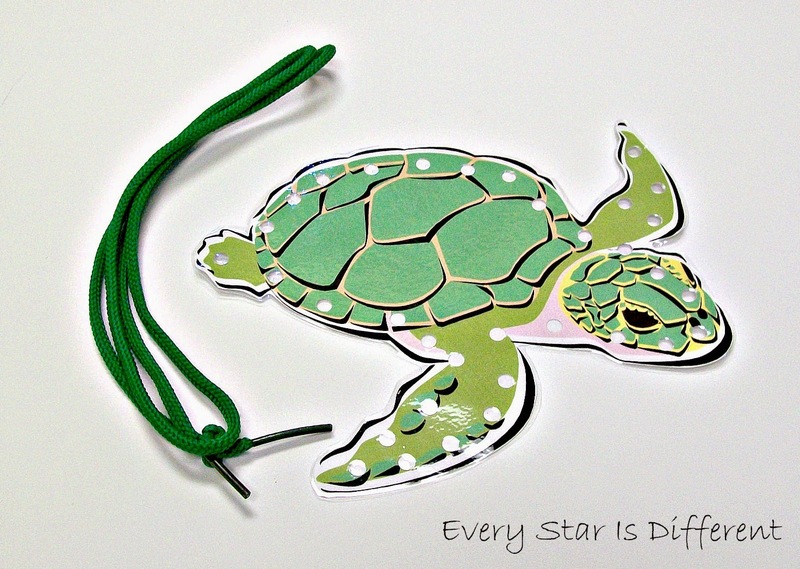 If you don't have sea turtle figures, the printable provides paper copies for you to use, or the option to match the number of turtles with the written number, by separating the cards. I'm leaving this activity very open ended for Sunshine, as I'm unsure how much she'll understand. 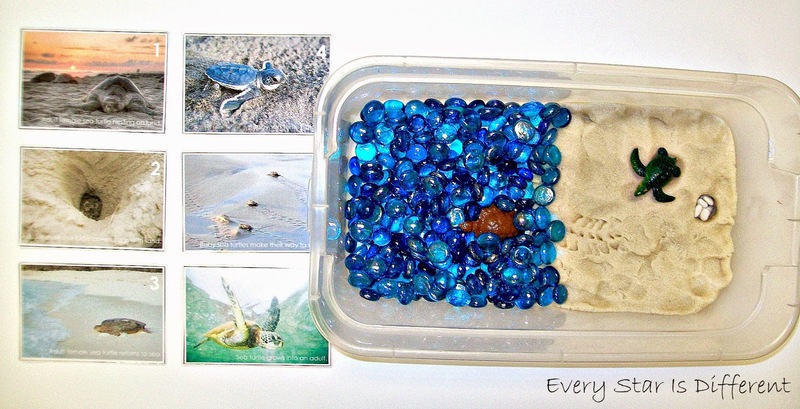 First, I'll present the life cycle of a sea turtle using the cards, and showing her the actions of the sea turtle with the manipulatives in the sensory bin provided. After, I'll show her one card in the life cycle and see if she can show me the same action using manipulatives in her sensory bin. If she appears to understand more, we'll work on sequencing the cards. If she doesn't seem to understand much at all, the sensory bin will provide loads of fun. In the printable there are two sets of cards provided, one with numbers and words, the other without to be used for a variety of activities. The sensory bin was made using blue glass beads (be sure to supervise 100% of the time) and homemade sand play dough. For turtle eggs I've used dried white beans. Turtle figures came from Safari Ltd. sets we have at home. 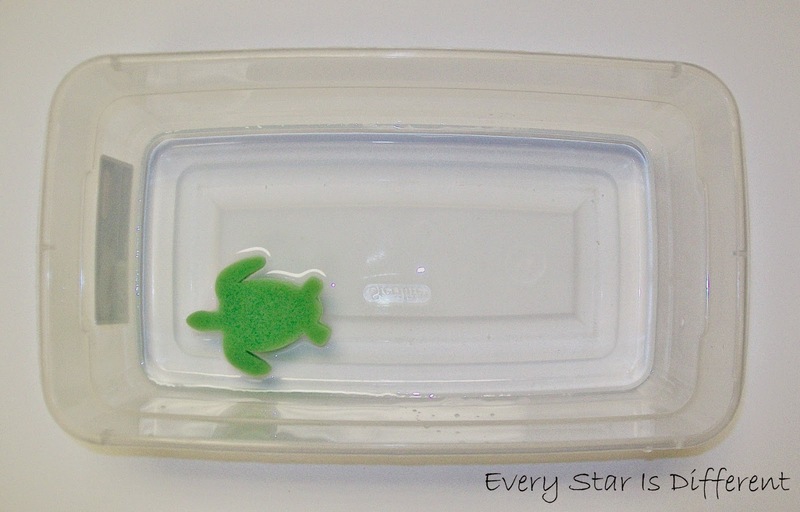 Sunshine will use the tweezers to transfer the foam sea turtles from one bowl to the other. Sunshine has very weak muscles in her fingers and hands. In this activity she'll work on strengthening muscles as she practices squeezing the water out of the sea turtle sponge provided. I've never tried lacing cards with Sunshine before. She loves fine motor tasks, especially ones that require her to take things in and out of small spaces. I'm hoping she'll enjoy it. If it's too hard, we'll move it aside and work on something else. 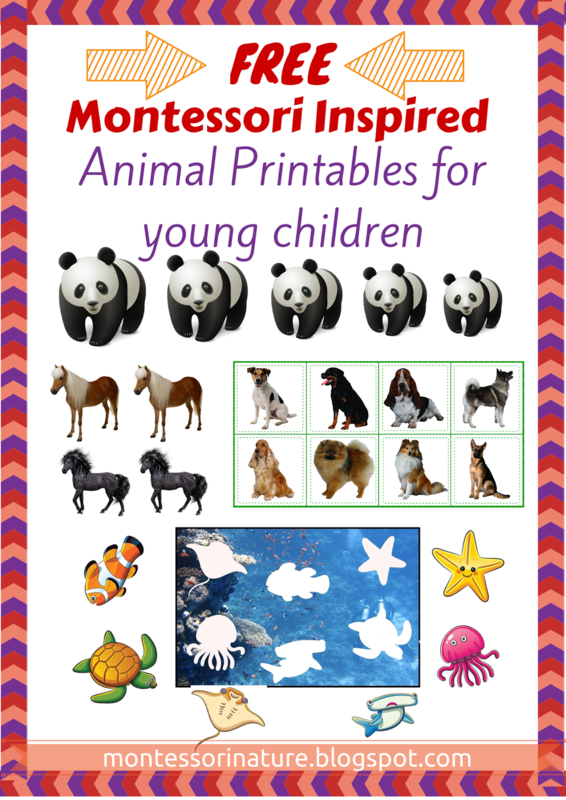 If you're looking for other fabulous ideas when studying the ocean, Anastasia from Montessori Nature has a fabulous free printable pack with an adorable ocean activity included! Click HERE to check it out! 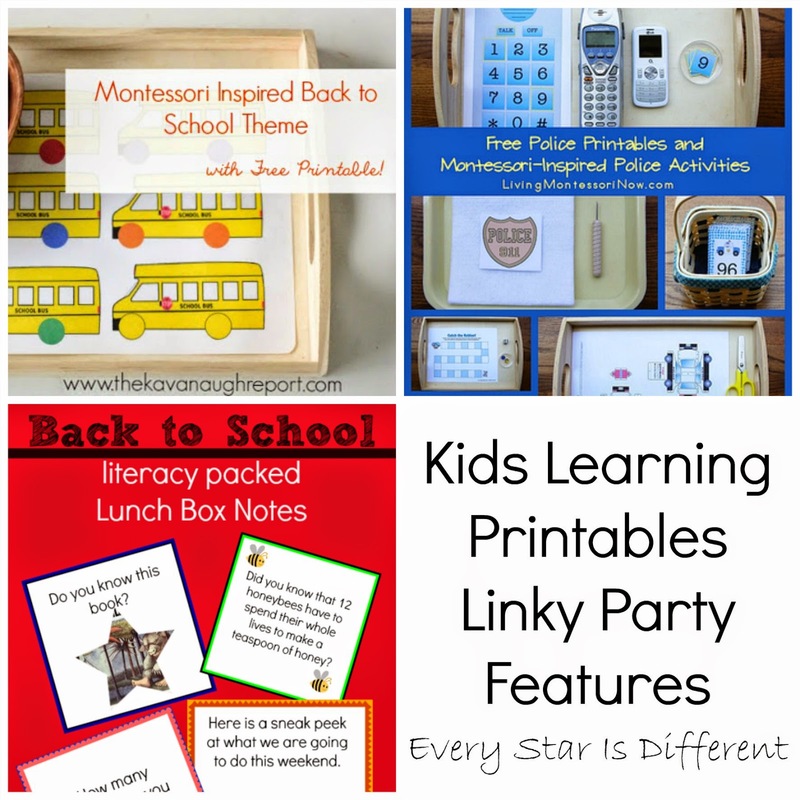 Welcome to the Kids Learning Printables Linky Party! 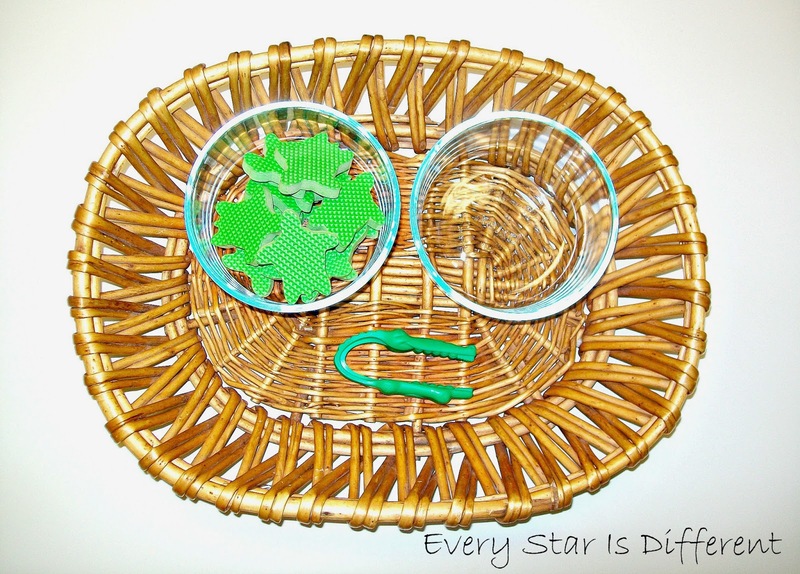 There were so many great printables linked up over the last two weeks. It was so hard to choose only three features. I don't know how I managed to do it. Check out these fabulous ideas! Thank you Deb! I love featuring your printable posts! They're just fabulous! I just found your blog and I am loving it. I was wondering where you got all your sea turtle things like sponge, foam, and counters? I'm so glad you're enjoying the blog! The sea turtle counters were part of Safari Ltd. collections we have at home. One is shown in the "my picks" section of the post. I found the sponge at our local dollar store. The foam sea turtles were part of a set of ocean creatures at our local Walmart in the baby bath section, but any foam cut outs would do, which I'm sure you could find at a craft store as well.